Hawk's Eggs can be harvested from hawks' nests. Hawks' nests look like other birds' nests which can be found throughout Skyrim, but you can tell the difference before seeing their name by the hawk feathers which may be lying next to them. They are only found in two places in the game, making these the only two sources of the ingredient: On the roofs of Heljarchen Hall and Lakeview Manor after building the Main Hall addition. You can reach these nests with a tower-style addition, or by using Whirlwind Sprint from a proper position for either property. You can also climb up the rocks next to Lakeview Manor and jump to the roof. Although you can also find a nest and two hawk feathers around it on the roof of Windstad Manor, it is a Rock Warbler nest. Hawk's eggs have the same alchemical properties as chicken's eggs. Combining these two ingredients will therefore result in all four effects being discovered at once. 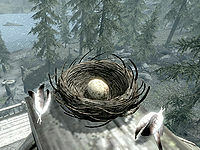 Hawk nests are present in Skyrim without having Hearthfire installed, such as those found in Solitude. However, they cannot be activated and contain no egg, and are usually inaccessible. This page was last modified on 11 April 2019, at 22:39.